In spite of the common vision and status that linked most of the delegates to the Philadelphia Convention, no obvious route existed for how to revise the Articles of Confederation to build a stronger central government. The meeting began by deciding several important procedural issues that were not controversial and that significantly shaped how the Convention operated. First, George Washington was elected as the presiding officer. They also decided to continue the voting precedent followed by the Congress where each state got one vote. 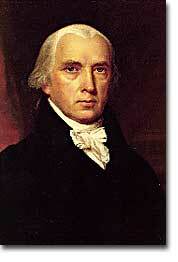 James Madison is known as the "Father of the Constitution." They also agreed to hold their meeting in secret. There would be no public access to the Convention's discussions and the delegates agreed not to discuss matters with the press. The delegates felt that secrecy would allow them to explore issues with greater honesty than would be possible if everything that they said became public knowledge. In fact, the public knew almost nothing about the actual proceedings of the Convention until James Madison's notes about it were published after his death in the 1840s. The delegates also made a final crucial and sweeping early decision about how to run the Convention. They agreed to go beyond the instructions of the Congress by not merely considering revisions to the Articles of Confederation, but to try and construct a whole new national framework. 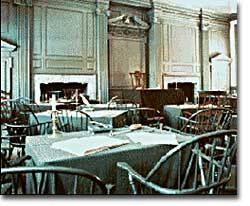 The assembly room inside Independence Hall is where the Constitution was signed in 1787. The stage was now set for James Madison, the best prepared and most influential of the delegates at the Philadelphia Convention. His proposal, now known as the Virginia Plan, called for a strong central government with three distinctive elements. First, it clearly placed national supremacy above state sovereignty. Second, this strengthened central government would have a close relationship with the people, who could directly vote for some national leaders. Third, Madison proposed that the central government be made up of three distinct branches: a bicameral legislature, an executive, and a judiciary. The lower house of the legislature would be elected directly by the people and then the lower house would elect the upper house. Together they would choose the executive and judiciary. By having the foundational body of the proposed national government elected by the people at large, rather than through their state legislatures, the national government would remain a republic with a direct link to ordinary people even as it expanded its power. 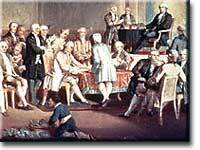 After deliberating for months, the delegates to the Constitutional Convention approved their new Constitution in September 1787. Madison's Virginia Plan was bold and creative. Further, it established a strong central government, which most delegates supported. Nevertheless, it was rejected at the Convention by opposition from delegates representing states with small populations. These small states would have their national influence dramatically curbed in the proposed move from one-state one-vote (as under the Articles) to general voting for the lower legislative house where overall population would be decisive. The Virginia Plan was unacceptable to all the small states, who countered with another proposal, dubbed the New Jersey Plan, that would continue more along the lines of how Congress already operated under the Articles. This plan called for a unicameral legislature with the one vote per state formula still in place. Although the division between large and small states (really between high and low population states) might seem simplistic, it was the major hurdle that delegates to the Convention needed to overcome to design a stronger national government, which they all agreed was needed. After long debates and a close final vote, the Virginia Plan was accepted as a basis for further discussion. This agreement to continue to debate also amounted to a major turning point. The delegates had decided that they should craft a new constitutional structure to replace the Articles. This was so stunning a change and such a large expansion of their original instructions from the Congress that two New York delegates left in disgust. Could the states ever form a more perfect union? A straightforward hypertext version of the complete Articles of Confederation. Article 11 of the Articles of Confederation invited Canada to join the other states in the Confederation. See what each of the Articles actually did. Who better to tell the story of James Madison than the people at James Madison University? An exhaustive resource of all things Madison, from simple biography to great Madison quotes. The site also features a quiz to test your knowledge of the Founding Fathers. Now a National Trust Historic Site, Montpelier was the home of President James Madison and his wife, Dolley. This site features sections on the history, archaeology and landscape of Montpelier, all of which are rich in images and information. Another fine hypertext by the Avalon Project at Yale University. Well presented and annotated, the site features three versions of the Virginia Plan presented by Edmund Randolph during the Philadelphia Convention of 1787. A hypertext version of the version of the Virginia Plan used by George Washington. Be sure to check out the images of the original, handwritten documents. A brief biography and portrait of William Patterson. He presented the alternative to the Virginia Plan, known as the New Jersey or Patterson Plan, to the Philadelphia Convention. Check out the bios of the other New Jersey representative while you're there. Browse day-by-day through the entire collection of James Madison's notes from the Philadelphia Convention. Read Madison's notes from June 18, 1787, on the proceedings surrounding the Patterson Plan. We all know that the Articles of Confederation and the Constitution as greatly different documents, but how different are they? This site lays out a point-by-point comparison between the 2 works. A poll by the National Constitution Center revealed only 17% of Americans polled knew when the Constitution was written (1787), 32% incorrectly believe John Hancock helped write it, and a handful of lost souls even think the first 10 amendments are called the Pledge of Allegiance. Yikes. Constitutional conventions are still happening today! In 1998, Australia held a convention to decide whether they should become a republic. Check out all the information on the proceedings and parties involved and see how the worldwide political process continues. A Constitution for the rich? Historian Charles A. Beard made waves with his radical interpretation of the Constitution and its drafters.